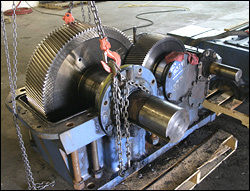 Great job on the Foote Jones Gearbox rebuild – we knew it was old and worn-out, but the shaft rebuild was an excellent solution. Items are fully disassembled, cleaned and evaluated. Housings, shafts, gear-teeth and all components are fully inspected. Only premium bearings and seals are used. 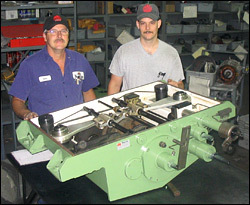 Any worn parts are replaced with OEM parts, or remanufactured in our in-house machine shop. During reassembly all spacers and gear patterns are aligned for precise gear timing. The gearbox is tested to OEM specifications.